Horoscope CardsThere are 14 products. Have you ever been wondering what to give to your loved one for birthday, anniversary, Chrismas or New Year's Eve? Have you been looking for a really special, original and unique gift? Have you ever thought of giving a personal gift - a Horoscope Card with his/her Zodiacal sign? In Horoscope Cards from e-shop Unikatnica you will also find described the main characteristic of the particular Zodiacal sign that unique card represents. and you can also add your own thoughts to personalize it. 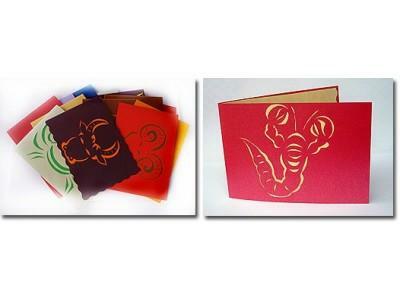 Each card is hand-crafted with unique motifs and patterns, which are made from different materials. To have a complete ready-to-give gift, you can also give a Horoscope pendants for women/men, found in the left menu. Such a wonderful, unique and thoughtful gift is definitely going to make your loved one smile and remeber you and your gift for ever. Unique, hand-crafted Horoscope Greeting Card - Pisces. Unique, hand-crafted Horoscope Greeting Card - Capricorn. Unique, hand-crafted Horoscope Greeting Card - Aquarius. Unique, hand-crafted Horoscope Greeting Card - Sagittarius. Unique, hand-crafted Horoscope Greeting Card - Scorpio. Unique, hand-crafted Horoscope Greeting Card - Libra. Unique, hand-crafted Horoscope Greeting Card - Virgo. Unique, hand-crafted Horoscope Greeting Card - Leo. Unique, hand-crafted Horoscope Greeting Card - Cancer. Unique, hand-crafted Horoscope Greeting Card - Gemini. Unique, hand-crafted Horoscope Greeting Card - Taurus. Unique, hand-crafted Horoscope Greeting Card - Aries.